If you only talk and do not practice hard, you will never reach high level. It will remain a puzzle never solved. 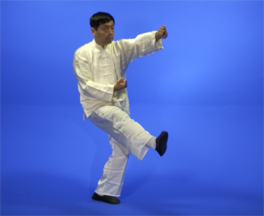 Shi style Baiyuan Tongbei Quan practitioners follow a very traditional method of training. They believe that their skills only exist for fighting and improving the condition of the body as a fighting tool. 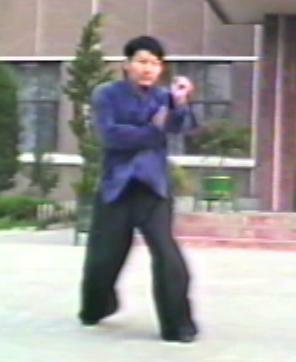 Many of the techniques are not very aesthetic and movements created for any reason other than for fighting are always ignored, ridiculed and even disregarded. 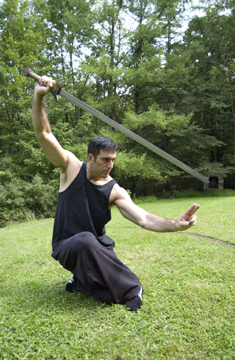 Most Chinese martial arts styles require the practice numerous forms. Tongbei practitioners do not think that forms are all that useful. In some groups, form practice is almost ignored completely. For example, there are some forms even in Shi style Tongbei but they are not taught that often. Emphasis is placed mainly on the development of individual skills. Once a student can perform all the single skills individually, it is possible to go on to study form. This should not imply that forms practice is for higher-level students, just that forms are not the most important, fundamental priority in your training. For basic gongfu training, many exercises are taught to relax and stretch the entire body. There is a special emphasis in this beginning stage on relaxing and stretching the shoulders, arms, back, legs, and waist. Extremely pliable shoulders and arms with a flexible waist are trademarks of an accomplished Tongbei practitioner. So as the result, Tongbei practitioners should have more relaxed shoulders, longer arms, and a more flexible waist. This method can let qi move freely and reach everywhere easily, and so internal power can be more powerful and flexible. Second, there are additional methods taught for increasing the generation of internal force for the arms, legs, waist, back, and for developing one's root or stability. 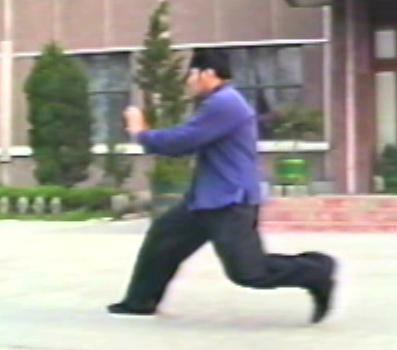 Tongbei moves are very quick with flexible footwork but stability is a very important factor emphasized in training. Some skills that generate and release large amounts of force require tremendous stability. It is said "when you are still, you should stand as a giant mountain. Nobody can move you." Third, there are further exercises geared toward balancing one's internal components (shen, yi, qi). This method of training is especially emphasized in Shi style. This training is very arduous and tedious requiring consistent and dedicated practice. Most masters assign this to students for their first several years of training because they believe these are the foundation skills for all advanced studies. In addition, it gives the master a chance to observe a student's character and personality. If one fails to practice these skills diligently and persistently, he would not be taught any longer. 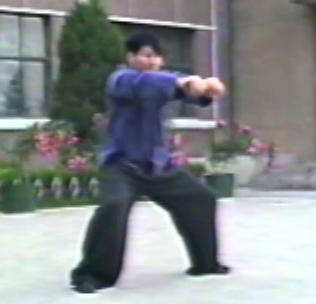 One feature of Baiyuan Tongbei Quan training is solo technique practice is especially emphasized. Solo technique is the foundation of fighting skills. For basic skills training the student studies single techniques one by one and repetitively. "Do it one thousand times" is the common refrain from the masters. The student practices solo to achieve a basic understanding of the technique in terms of its meaning and to develop proper coordination. The technique is then practiced on a bag and/or padded post so that the student gets the right feeling for releasing force in full contact striking. In this training, each single skill should be practiced thousands of times until the student can really master it. It is important not only to know the standard way of doing the technique but also all possible changes and variations. All movements become one's natural reactions. After this, if the student has practiced hard and is worthy, the master explains more about the timing and angles. How the skill should be applied in combat with all possible changes and variations are passed down. Once the student has progressed through these stages for one technique and is able to do it well, then they are taught the next technique. Combination skill training is one of the most important training methods for fighting. Usually a combination skill composes by 2- 5 solo techniques. In each generation, masters designed their favor combination skills. So in different branches, there are many different combination skills but all are baseed on the same or similar solo techniques. Actually the system encourages people to create their own combinations according to their own body conditions and personalities when people can understand solo techniques and basic principles of combination skills. 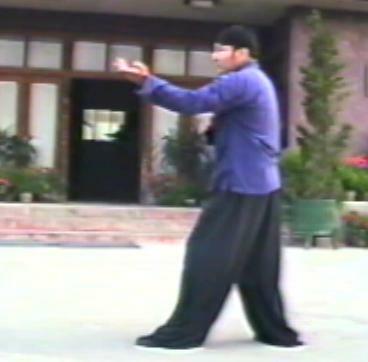 In Baiyuan Tongbei Quan, there are not many forms because people believe form practice is not too useful for application. In tradition, there is only one form in Shi style, that is the Twenty-four Postures form. Sometimes people call it the source of Baiyuan Tongbei. Later other forms were added in. In our lineage, Eight Ancestry Form and Thirty-six Take Apart Fist Form are also taught commonly. But form training is not emphasized. 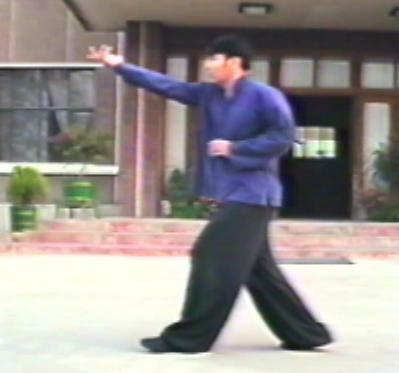 Iron palm is one of the most useful skills in Baiyuan Tongbei Quan. It has a very special training method. In fact iron palm training is not just for the palms, it also includes other parts of the body, like the arms, legs, body, and feet. The training method is very different from other styles. First a special post and bags need to be made for striking. Second a special combination of herbs have to be prepared to treat the body part being conditioned in the striking. The training does not emphasize making the hands "hard" for breaking things. The hands should stay soft with the skin remaining smooth. The hands do become harder but this is not the main goal of the Tongbei practitioners, learning to develop internal power and unite one's whole body force into one force with Qi flowing freely is the goal of Iron Palm Training. Tongbei masters believe making the hands too hand causes the loss of flexibility and sensitivity. So this practice must be done carefully under expert instruction. 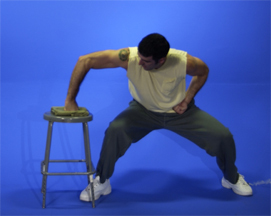 Often times this training is referred to as "Internal Palm Training". 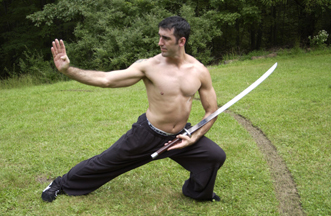 The reason being is the goal is to be able to move the internal force to the part of the body doing the striking. This requires soft totally relaxed strikes to the bag or post. The practitioner tries to use the whole body behind each movement uniting the force into one point. The use of brute strength and muscle to "hit the bag hard" is considered too external and is discouraged. It does not allow the Qi to flow to the fist (palm, elbow, etc.) for the body is tight and tense. When the body is tense and the desire is to hit with brute force, one only hits with isolated muscles groups. The goal is to combine all the muscles of the body to unite and move together relaxed and free. The herbal solution also opens the meridians allowing the Qi to flow while hardening the ligaments, tendons, and other tissues. 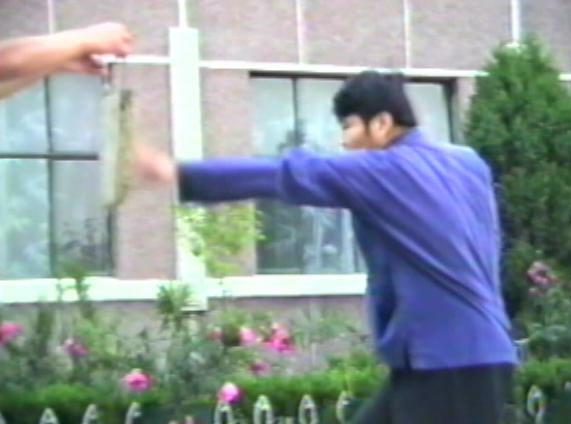 In fact, bag and post hitting are considered the root of all skills in Tongbei Quan. 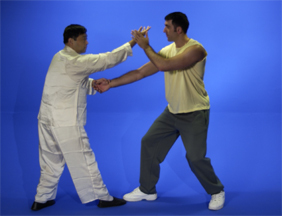 Two person fighting training is one of the most important stages to learn how to fight. There are several steps in this training for different purposes. The first step is fixed set training practice. There are many fixed routines for different purpose. This training enables a detailed study of attack and defense. 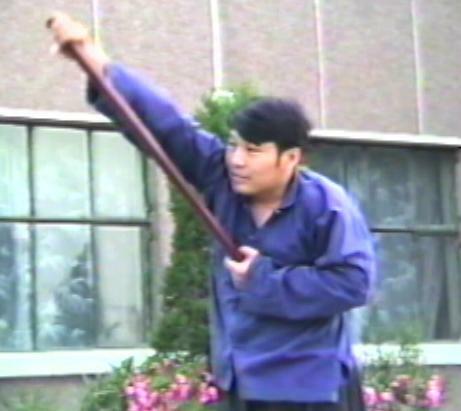 This is a prerequisite for mastery of Tongbei fighting skill; it is said, "If you want to master Tongbei skill, you must always fight with a partner". There are different routines depending on the goal of the training. For hard contact training, the partners hit each other hard in order to increase striking power and enhance defensive skill. Other sets are for training reflexes, which increase speed and reduce reaction time. Still other sets are designed for detailed research of each skill and all their variations. 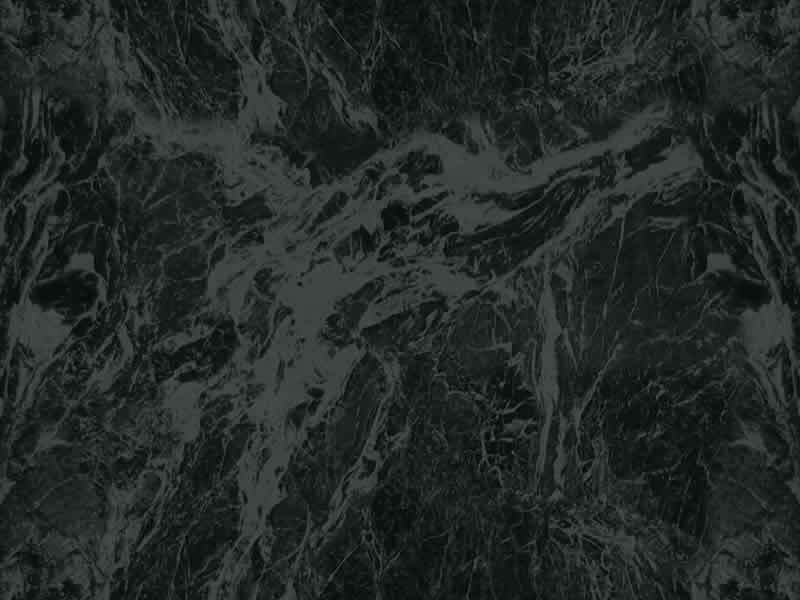 Such fixed routines are not always standardized by famous masters. Partners can make up their own routines according to their needs. So the second step is self-design set training practice. In this step, practitioners design their own routines from their favorite skills and try to use them on their partners. At this time, the partner just "feed" some skills without fight back. So practitioners can focus their mind to use their skills in the best way under the most ideal situation. In this step, practice each routine repeatedly from both offensive and defensive perspectives. Generally, a single technique is practiced first and then combinations are introduced. Usually this involves two to five individual techniques in combination. These practice routines must be done very slowly and carefully at first before adding speed in order to minimize the risk for serious injury. Body protectors are often used to avoid injury during full-speed practice with a partner. This also allows one to get an accurate feeling of how these skills would work in a real fight. Proper training in Tongbei develops tremendous striking power and injuries can sometimes occur even when a body protector is worn. After practicing the fixed routines, the student progresses to free-style fighting with a partner. Each partner can use any skill he likes and is not required to tell the partner what he plans to do, which is very much like real fighting. Be careful it is still training, even this step is very close to real fighting but it is not a real fighting. So when one uses some skills, one should focus more on how to make the skill better and attitude not just how to win. Do detailed research, keep the mind clear, be patient, and keep relaxed, and never have a bad attitude. The movements should be consistent in principle with the strategy of the ape described in the principle page. Body protectors are essential and force control is important during this type of training to avoid or limit injury. The most important point in this training is not to be concerned about wining or losing. This is the time to focus on the skills themselves, reflecting objectively on why the encounter was won or lost. Most important is not to get angry when hit hard. Part of the development of Tongbei skill is accepting the fact that one will get hit a lot before learning eventually how to win. For safety reasons, some controlling and throwing skills should be understood in detail very well before trying to use them. It should be very clear when and how they can be used. 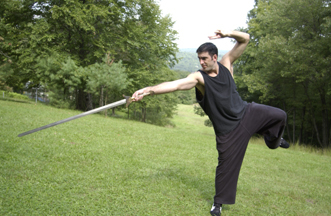 Like all other traditional martial arts, Baiyuan Tongbei Quan has 4 basic weapons, they are Dao (which is long saber called Miao Dao), Jian (straight double-edge sword), Gan (staff), and Qiang (spear). 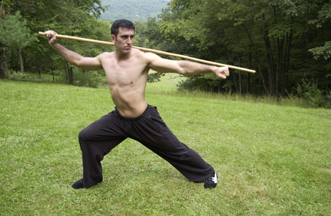 Dao and Da Ganzi (long staff) are famous weapons in Tongbei, adhering in use to the same principles developed in unarmed fighting. 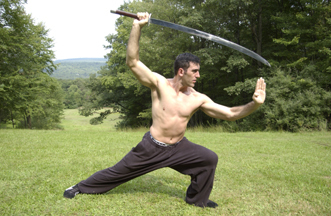 There are some weapons forms, but they tend to be ignored in favor of practicing individual techniques and two person routines for combat practice. Since times have changed, weapon training is uncommon among most Tongbei groups today. 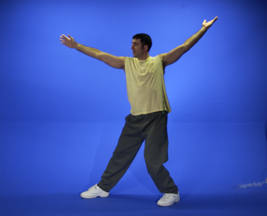 The Tongbei qigong training is only taught in a few groups. 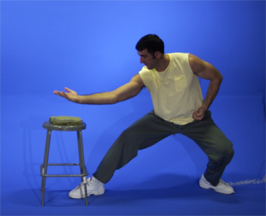 Shui Gong Fa or Sleeping Qigong is the most common form used by Shi style Tongbei practitioners. 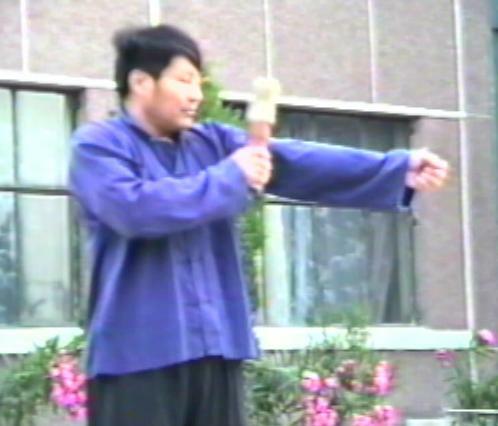 Chen Tuan is said to have invented this Taoist qigong training while practicing on Hua Shan Mountain. Interestingly, most of the postures in this qigong method are practiced lying down on a bed, and mimic the various sleeping postures, hence the name. 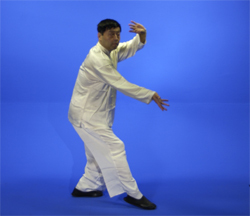 Six Primary Hands (Liu Lu Zong Shou): These include six single skills, each expressing a main idea of Tongbei, and representing the foundation skill for all Tongbei training. 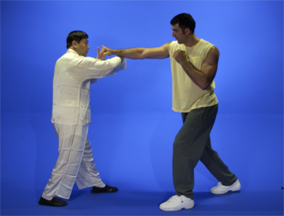 Eight Ancestry Fists (Ba Shou Zu Quan): This is a short form including eight skills selected from among those used by Tongbei masters to quickly win fights. Twelve Linking Fists (Shi Er Lian Quan): This set includes twelve short combinations, with each consisting of two to five individual skills. Each of the 12 combinations should be practiced separately to develop an understanding of how combinations or continuous skills are used in fighting. 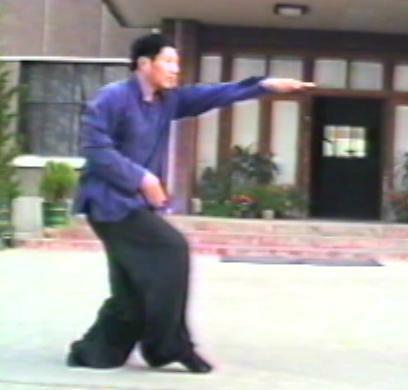 Twenty-four Posture Form (Er Shi Si Shi): This is considered the main routine of Shi Style Tongbei, consisting of twenty-four skills, which many believe form the oldest or original form of Tongbei. However, this form is not usually taught as a continuous form. Practitioners prefer to hone each skill separately and in great detail. Only when every skill is done well should they be linked into a form. It is very common that some modern day practitioners have practiced each of the individual skills for many years but still do not know the entire form in continuous linkage. 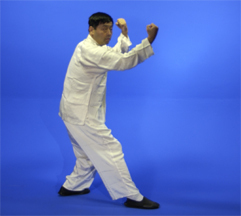 Six Sections of Son and Mother Xinji Take Apart Fist (Zi Mu Xin Ji Chai Quan Liu Tang): This is a combination form including thirty-six skills, so commonly it is just called Thirty-six Take Apart Fist. The first part of the name means every skill should be changed and can generate more skills, just like a mother can have many childen. The second part of the name means the form should be taken apart to practiced. So it is usually studied as individual parts for teaching and practice. 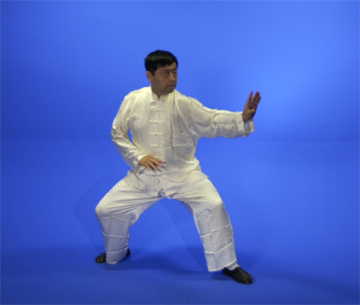 Although there are not many sets and routines in Shi Style Baiyuan Tongbei Quan, the approach to mastery and unfolding many of the secrets requires the guidance of a knowledgeable master. A continuing detailed study of how to vary and change between the different skills is also necessary. Unlimited skills can be generated from these basic skills, so the ability to change and interchange is the key point for developing higher-level Tongbei skills. Besides these routines and set, there are more than a hundred solo techniques and combination skills taught.